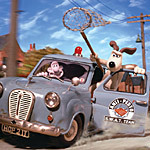 Like a good Wensleydale cheese, Wallace & Gromit movies have a mild but distinctive flavor that is simply delicious. Wallace and Gromit are the clay creations of Nick Park. They have three short films under their belts, all available and recommended on home video. Wallace (voiced by Peter Sallis) is a cheese-and-cracker loving Rube Goldberg inventor. Gromit is his trusty, mouthless dog who gets him out of every scrape he gets into. Park had set aside his loveable heroes for his first feature, Chicken Run. Now he picks them back up and puts them on the big screen in The Curse of the Were-Rabbit. In it, our heroes run Anti-Pesto, a humane pest removal company. Most of their clients are entered in the giant vegetable competition, and they call on Wallace & Gromit to remove the rabbits that threaten their prize potatoes. As if the plague of rabbits weren’t enough, there seems to be a giant, ravenous were-rabbit ravaging the countryside and ravishing the towsfolk’s cauliflowers. Lady Tottington hopes our humane heroes can stop the were-rabbit, because if not, she may have to let Victor shoot the poor best with one of his golden bullets. Some examples: I caught a brief glimpse of a stained glass window with an angelic herald blowing its brazen trump; underneath, three wise men covered their ears. It was so far in the background that I nearly missed it. My movie partner saw something about a Wensleydale fan club poster in Wallace’s room that I completely missed. Wallace & Gromit: Curse of the Were-Rabbit is definitely a movie that deserves a DVD and a pause button. But more important than the hidden jokes is the almost unbelievable craft that has gone in to creating the characters and their world. Many film buffs love to see King Kong’s fur ripple, knowing that Willis O’Brien had touched it. Likewise, in the closeups, you can see Nick Park’s fingerprints on the characters’ faces, which makes it all the more uncanny when the characters come to life. It’s truly amazing how expressive Gromit is, even though he has no mouth. But none of this would be nearly so impressive if the characters weren’t so endearing. There may be a double entendre or two over the course of the movie, but Wallace is so gentle and naive that he probably isn’t even be aware of them. Wallace is a product of his world, which is innocent and polite, although thankfully not sentimental, saccharine, or idealized. Even our villain isn’t evil. He’s full of himself, and willing to shoot a monster, and that’s about as bleak as things are in the mild world of Wallace & Gromit. It’s a great world to visit, no matter your age.